Last December, Sheila Patek, a Duke University biologist who studies the mechanics of movement in, among other organisms, the Panamanian mantis shrimp, had her worst fears realized. An email arrived at her lab from a producer at the ABC News show, Good Morning, America, saying that her NSF-funded research had been singled out by U.S. Senator Jeff Flake (R-AZ) in his new “wastebook,” as an outrageous misuse of taxpayer money for staging “shrimp fight clubs.” Four months later, Patek finally got her chance to fight back, taking her research to Capitol Hill on April 14 to explain how the mantis shrimp uses its extremely high acceleration hammer (which her lab discovered) to demolish shelled prey while fending off territorial rivals without killing them. The occasion was a kind of grown-up science fair entitled, “Wasteful Research? Looking Beyond the Abstract,” organized by the Coalition for the Life Sciences (CLS), of which the ASCB is a founding member, along with the Coalition to Promote Research and the Coalition for National Science Funding. It allowed Patek and 10 other scientists who had also been ridiculed by so-called “deficit hawks” in the House and Senate in annual “wastebooks” to explain the critical biomedical and environmental issues behind their experiments. At the CLS poster session, Patek gave a nonstop seminar on the still largely unknown biological physics of the mantis shrimp that can deliver a blow from its ultra-fast hammer with the acceleration of a bullet leaving a gun muzzle. The hammer system is driven entirely by muscles, springs, and latches which can punch through impact-resistant armor of snails, a favorite food source, yet under such control that in sparring with other shrimp, the mantis shrimp can drive off opponents with a rain of sharp taps without killing them. Patek told the milling crowd of Members of Congress, their staffers, scientists, and media in the Russell Office Building that the mantis shrimp’s combat style intrigued the Department of Defense, another funder of her lab with its interests in armor, smashing armor, and non-lethal force. Patek has always known that she was vulnerable to public misunderstanding about her field. Her lab has studied mechanical movement in shrimp and acoustical defenses in lobsters, subjects that she knew could be easily misconstrued. She has maintained a public-friendly website with a page devoted to “Why Does This Research Matter?” Patek also has ongoing projects with undergraduates and high school science teachers on exploring the research experience. But Patek was rudely awakened by Sen. Flake’s wastebook attack, especially for its impact on her graduate student, Patrick Green, whose thesis project was on non-lethal “telson sparring” between rival shrimp. Researchers in her field rarely garner national headlines for their work and then often for the wrong reasons, Patek says, but watching criticism land on a grad student with no experience in public controversy was especially difficult for her. She quickly turned for help to Duke’s public communications office which rallied to her defense. 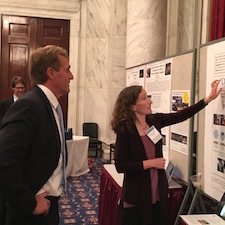 Taking her story in person to Capitol Hill was deeply satisfying for Patek especially when one of those who stopped by was Sen. Flake himself. He listened in rapt attention as Patek explained ultra-fast biological hammers and non-lethal combat strategies before moving off to hear other posters. Wastebooks are now annual events on Capitol Hill. Scientists are targeted without warning or the chance for rebuttal by the staffs of congressional deficit hawks, keen to highlight what they consider wasteful federal research. Wastebooks tend to dismiss much basic research as frivolous, ignoring detailed rationales or broader implications. The CLS believes that these attacks on valid, peer-reviewed work should not go unanswered. Another counter strategy to congressional wastebooks might be indicated by mantis shrimp themselves. Green and Patek studied high-speed imaging of 30 contests between captive shrimp, discovering that it wasn’t the shrimp who hit hardest who won the bout but the one who hit the most frequently. The researchers hypothesized that the ritualized fighting could be a display of overall vigor and tenacity rather than outright punching power, something scientists should always remember on Capitol Hill.